The Royal Navy was forced to bite its stiff upper lip and hide its intense disappointment three years ago when Prince William decided to follow his younger brother Harry into the British army. The navy had hoped that the second in line to the throne would follow the tradition established by his father the Prince of Wales, his grandfather the Duke of Edinburgh, great-grandfather King George VI and earlier generations of the Royal Family, and join the "senior" of Britain's three armed services. 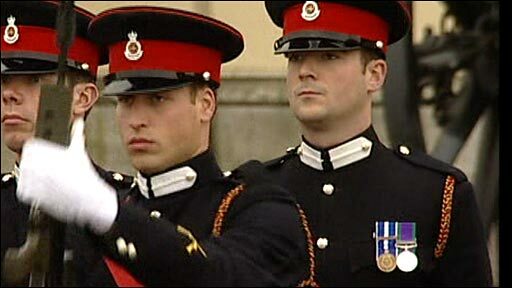 But in another example of William's determination to do things his way, he elected to don the khaki uniform of the Army and went off in 2006 to gain his Commission at the Royal Military Academy at Sandhurst, before joining Harry in the Household Cavalry's Blues and Royals regiment. It was a galling experience for the Royal Navy, and particularly so at a time when - in some quarters - the relevance of Britain's maritime force was coming under scrutiny. A navy which, less than a century ago, was by far the most powerful in the world, seemed to have become somewhat marginalised in the post-Cold War era of regional conflicts in which aircraft and ground forces seemed to dominate. Perhaps William's decision not to make the Royal Navy the first choice of his brief military career owed something to the feeling that it was no longer quite the force that it used to be. Yet the main purpose of William's military service is to familiarise him with all three of Britain's armed services, so that as King he can demonstrate an understanding of the ethos of the services which owe their loyalty to the Crown. He has spent a year with the Army - though, unsurprisingly, given his proximity to the throne, he was never considered for an operational tour of duty such as Prince Harry's deployment to Afghanistan earlier this year - and he has spent five months with the RAF learning to fly and gaining his Wings. In that limited time, Sub Lt Wales must learn basic boat-handling and sea-safety techniques. He will also spend some time with the navy's own air-force, the Fleet Air Arm, and the submarine service. He will be taken on a dive in a nuclear attack submarine on exercise with the fleet. Then, of course, there's the navy's "army", the Royal Marines. This is the notoriously hard fighting force which William's uncle, Prince Edward, attempted to join in the 1980s. After a couple of months Edward found that the physical hardships of the training course were not to his liking. He left the Marines for a career in the theatre. William will have no such difficulties. He has already shown that he can cope with the physical demands of military life as a cadet at Sandhurst and he will not be joining the Royal Marines on any of their survival exercises. He will, however, be shown the Marines practising their skills as Britain's amphibious and commando force. Then, three weeks after he starts his attachment to the navy, the Prince will embark for five weeks at sea, aboard the frigate HMS Iron Duke. She is currently Britain's designated North Atlantic Patrol ship, on station in and around the Caribbean, where she is available to offer assistance in the event of hurricane damage. And, importantly, she will be spearheading efforts to intercept vessels involved in drug smuggling. According to senior officers, it is quite possible that William - given his army background - would be part of any boarding parties sent to search suspect vessels, in which case he would, like all the members the such groups, be armed. However, the navy is at pains to point out that the future King would not unduly be placed in harm's way. "If there's any chance of any shooting, he won't take part," said an admiral. But, as far as possible, Sub Lt Wales will be treated like every other member of the ship's company. In all probability he will share a four-berth cabin with other junior officers and be expected to participate fully in every aspect of the running of the ship. "As far as the training goes, it's very rigorous because we don't have passengers out in warships for obvious reasons" said Rear Admiral Robert Cooling, Assistant Chief of Naval Staff - which was a polite way of saying that William will not be taking any naval helicopters for "joyrides" to parties, as happened during his time with the Royal Air Force. What does the Royal Navy hope William will get out of the experience? The official answer is that it hopes William will emerge after eight weeks with a better understanding of what the modern navy does and how it functions. 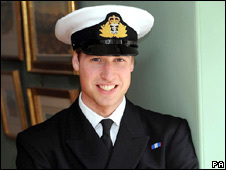 Unofficially, the navy is hoping to show Prince William that he made the wrong choice when he went into the army, and to persuade him that he should have followed Royal Family tradition and entered the Royal Navy.